The objective of this induction heating application is to bond rubber gaskets to a steel gas tank intake manifold within 6 seconds at 350°F. without foaming. Two two-turn pancake style inductors were specially contoured to the the shape of the steel assembly to produce uniform heat in the gasket areas. The steel assembly was initially heated without gaskets to establish a heating pattern and time-to-temperature. After a satisfactory heating pattern was obtained, the gaskets were positioned over the joint areas. RF power was applied for 6 seconds to reach the bonding temperature of 350°F. 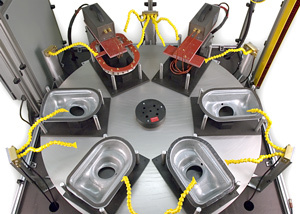 Consistent and repeatable results were achieved with the EB-2 Bonding System operating at 350°F with a heat cycle of 6 seconds. 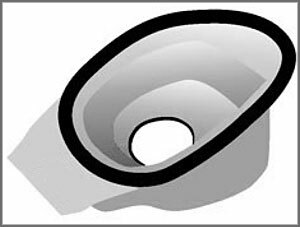 By locally heating the steel directly under the gaskets with induction, the gaskets were consistently bonded to the steel without foaming. Bonding metal to rubber is an excellent application for innovative induction heating.